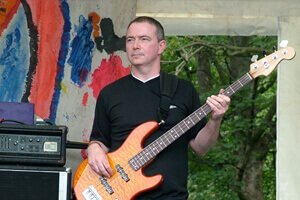 Bass Guitar lessons in Leeds with Gordon C.
I have over 25 years experience of playing the bass in live bands, and over 10 years as a tutor. Over the years I have played a variety of styles from punk and funk through to rock and swing. I currently play bass in 3 function bands all in the Yorkshire area. I teach in schools in East Yorkshire and at a Music Centre in Rothwell. I have previously taught at Bradford College. I like to teach to the student's musical taste as soon as basics are covered. Try to make lessons as song based as possible. I have lots of transcriptions/tabs to tunes in a wide variety of styles. Lessons are interactive as students can record bass/guitar parts to backing tracks. I think it's great when people write their own songs/riffs/bass lines and I like to incorporate improvisation into lessons as soon as students are ready for it. Former students have gone on to study at ACM (Academy of Contemporary Music) and BIMM (Brighton Institute of Modern Music)as well as taking various music tech courses. RGT and Rockschool up to Grade 8 bass. I have taught both the RGT and Rockschool syllabus to a number of students over the years, with a 100% pass rate. Improvisation: I use garageband, Ableton and Logic software to record students playing either their own ideas or covering a tune they have learnt. The best place to have a lesson is at my house as everything is set up and ready to go. Lessons booked for between 09:00 and 14:00 Monday, Tuesday and Wednesday are £20 per hour. Taking lessons with Gordon has improved my technique, musical knowledge and general playing ability drastically.I really enjoy the lessons as it is a relaxing and friendly environment to learn in." Excellent tutor, knows how to teach and is very experienced." After making contact, Gordon will normally be in touch with you within 48 hours. You will also receive a confirmation email, which includes Gordon's contact details.